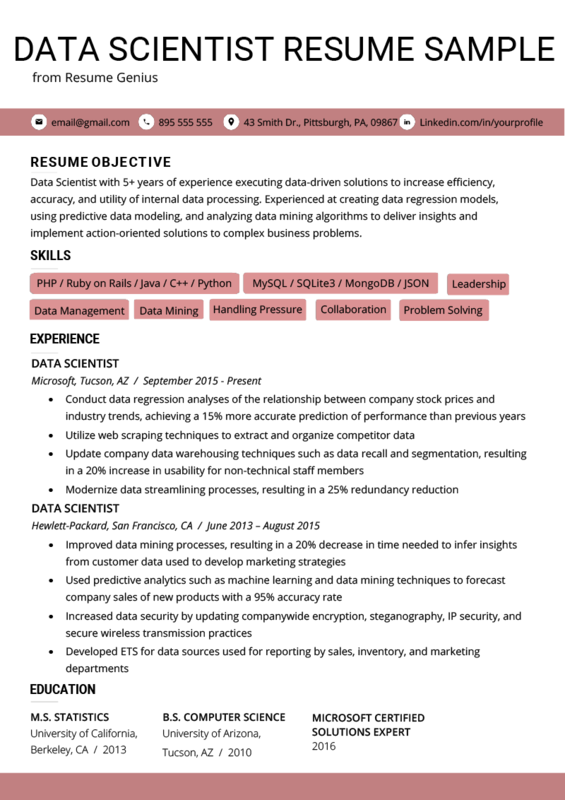 Get all the tools you need to write the perfect data scientist resume. Below you’ll find your free downloadable sample, matching cover letter, and four expert writing tips. Data Scientist with 4+ years of experience executing data-driven solutions to increase efficiency, accuracy, and utility of internal data processing. Experienced at creating data regression models, using predictive data modeling, and analyzing data mining algorithms to deliver insights and implement action-oriented solutions to complex business problems. Looking to use my Bachelor of Computer Science and Master of Science in Statistics to manage statistical machine learning and data-related solutions at your organization. Webster’s defines data as “information in digital form that can be transmitted or processed.” Although this definition holds true, the world’s understanding and use of data have undergone a rapid revolution in recent years. Data has emerged as a technological juggernaut, permanently altering the way human beings live. Businesses were among the first to realize the value of data, and thus began the race to learn how to use data to gain a competitive advantage. Naturally, as companies have increased resources invested in data use, there has been a rise in professions exclusively focused on data. Data scientist is one such career that experienced a steep increase in demand in the last decade. The career opportunity has gained global attention in recent years as the number of available data scientists positions and their awarded salaries continue to climb. In 2016, Glassdoor named data scientist as the best job in America, and according to Forbes, data scientist is among LinkedIn’s fastest-growing jobs. So, whether you are an aspiring data scientist or a seasoned pro, congratulations on selecting a lucrative, stimulating, and impressive career opportunity! The next step toward landing your dream data scientist role is to use this resume sample and follow these four easy tips to craft the perfect resume! Rather spend your time pouring over data sets than writing resumes? Skip right to the finished product with our renowned resume builder! 1.Write a career objective that’s got it all! There is contradictory information available when it comes to the career objective section of technical resumes. Some sources suggest you forfeit this section, reserving as much space as possible to elaborate on your technical skills. We suggest that you include a career objective on your data scientist resume. It’s likely the first thing a hiring manager will lay eyes on when they pick up your resume. Think of it as the way to deliver your relevant experience, skills, and education in a neatly wrapped, easy-to-read introductory package for the hiring manager. 1st: State the number of years of experience you have as a data scientist and an overview of the duties and tasks you were in charge of. For your data scientist resume, you want to pay special attention to the second point focused on your experience. This is your opportunity to showcase specific programs, processes, coding languages, data sets, sizes of data, and algorithms you have worked with — essentially any technical experience that will impress the hiring manager right from the get-go. Looking for more information on writing career objectives? Check out our complete guide to writing career objectives. Evidence suggests that hiring managers only take an average of six seconds to decide whether to keep reading your resume or trash it. Excluding a career objective from your resume, or failing to include the relevant information, could land your resume in an already overflowing recycling bin. Want to make sure your resume is up to scratch? Try our 6-second resume challenge and find out if your resume passes the test! For starters (literally), you want to begin each bullet point in the professional experience section of your resume with targeted action words. Using robust action words is critical in persuading a hiring manager to read the rest of your resume and offer you an interview. Looking for more action words for your resume? Look no further, we have comprised The Longest Action Verb List In The Universe for you! So, you’ve got this terrific career as a data scientist, one of the hottest jobs on the American job market. On a daily basis, you manage large data sets, analyze complicated algorithms, and conduct complex statistical machine learning processes. You are proud of your accomplishments and want to share the breakthrough results you are producing at work — BUT you are unable to explain the intricacies of your technical jargon-heavy profession with your friends and family. Don’t worry, the professional experience section of your resume is the perfect place to use technical lingo and brag about the accomplishments of your data scientist career. The professional experience section of your resume is used to describe your accomplishments in previous roles. Adding quantities to these accomplishments demonstrates that you are a results-oriented data scientist. It also displays the measurable impact on time, percentages, and dollar amounts your actions had. A career as a data scientist means that you are working with numbers all day, every day! So, wouldn’t it be weird if you didn’t include them on your data scientist resume? If the quantities and technical jargon were removed from the points above, you would be left with generic and non-descriptive points that could describe the responsibilities of almost any profession. By including quantities and data specific vocabulary, you will impress the hiring manager and prompt questions of how you achieved these results for your interview! We have saved the most important tip for last — how to include technical skills on your data scientist resume. 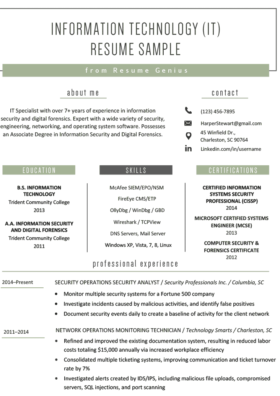 It is crucial that your data scientist resume convinces the hiring manager you have the computer skills and software knowledge necessary for the role. You can easily accomplish this by strategically sprinkling the information they are looking for throughout your resume. Additionally, technical skills are like winning lottery numbers where Applicant Tracking Systems are concerned. Matching the technical skills on your resume to those found of the job description of the role you are applying for is a surefire way to win against dreaded ATS robots. Feel like your technical skills don’t measure up? Learn new skills and beef up your resume with these 100+ free educational websites! That’s it! 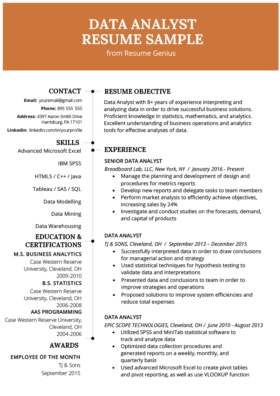 You are ready to create your own data scientist resume. Good luck landing employment with your dream company. If you have any questions, leave a comment and the Resume Genius team will get back to you ASAP!